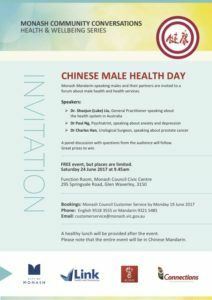 Monash Mandarin-speaking males and their partners are invited to a forum about male health and health services. A panel discussion with questions from the audience will follow. Great prizes to win. A healthy lunch will be provided after the event. 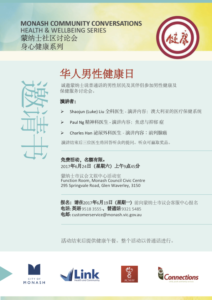 Please note that the entire event will be in Chinese Mandarin.